It rained and it rained. I put on some foul weather gear. But after about 30 minutes I had to admit defeat – the area around the base of the wall had turned to a quagmire – I was slipping and sliding all over the place. When carrying large stones this seemed like a recipe for disaster. Time for a new plan. I swapped to stripping out the next section of wall, but after a while I had to give up on this too. The last resort was pruning the apple trees in the orchard. These haven’t been pruned in years and are probably well passed being saved, however, it is worth a shot. I have attempted to thin out the canopy on each of the trees – particularly were a number of the branches had grown in on themselves. Hopefully, this should bring some more light to the inner parts of the tree. I also removed any branches that were growing downwards or were damaged. There is a crab apple tree amongst the fruit trees. 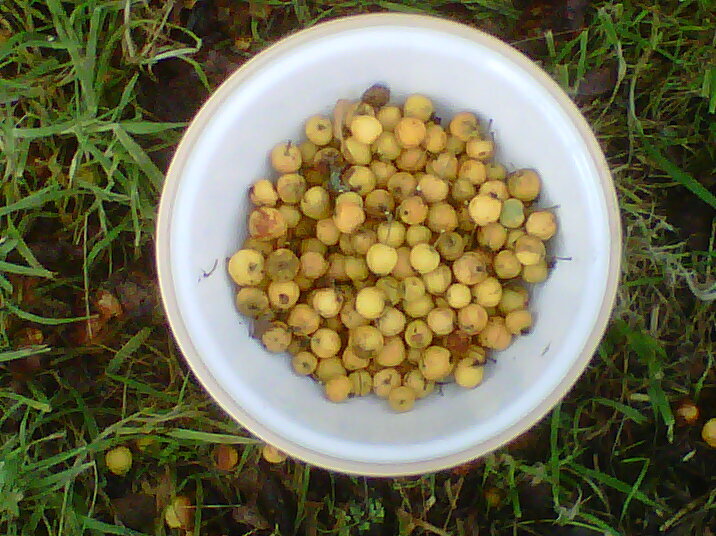 Jo made some crab apple jelly a few weeks ago and we decided to collect some more for crab apple vodka – like sloe gin, but with crab apples and vodka. Sounds a bit more interesting than jelly, but we will see. 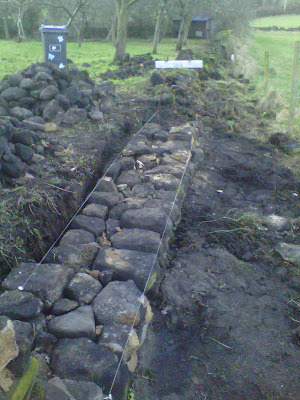 ﻿﻿ The rain stopped, briefly, in the afternoon and I returned to the dry stone walling. With such a long section, progress looks slow. The first couple of courses are hard work since many of the larger stones go into the base of the wall. It can be a bit disheartening. Day 9 – Mud everywhere!